Bits and cutters of industrial and dental quality: Router Bits. With 3.2mm (1/8") shanks, inverse ground flutes and maximum speeds up to 30,000rpm in different profiles for optimal results. One each: Slot cutter Ø 3.2 - 4.3 and 6.5mm (1/8" - 11/34" and 1/4"), rounding over cutter Ø 6.4mm (1/4"), V-slot cutter Ø 6.5mm (1/4"), combi cutter 6.5/2.5mm (1/4"), core box bit R 3.2mm (1/8"), rebating cutter 6.4mm (1/4"), edge cutter with pin 5mm (3/16"), angle cutter R 45. Neatly packed in wooden box. 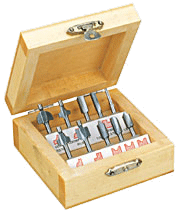 The wood router cutters offered here should only be used with tools that have a safety mechanism.